There’s something about a guitar solo that can make an unremarkable song into a phenomenon, and even non-musicians will usually have a favorite guitarist, whether that’s Eric Clapton, Stevie Ray Vaughan, Jimi Hendrix, or, well, you get the picture… Music is a vital part of our cultural expression, and perhaps no musical instrument has shaped the development of music through modern history as much as the guitar. But what’s the history of the guitar itself? Why did this one instrument become the iconic symbol of 20th Century musical genres such as jazz, blues, and—of course—rock and roll? Although much of the early history of the guitar is unclear, stringed instruments have been part of human life for thousands of years. Medieval Spain is where guitar history first began to take shape, but it wasn’t until the 20th Century that it truly came into its own as an instrument. It was a key element in the development of rock and roll—especially with the advent of the electric guitar—and contributed to the creation of nearly every other modern musical genre. Images of stringed instruments appear in carvings that are more than 3,000 years old, dating from the Mesopotamian and Babylonian Empires. Our modern word ‘guitar’ probably comes from the ancient Greek word κιθάρα (kithara), and doubtless, stringed instruments existed prior to recorded history. Most scholars agree, the two instruments that played the biggest part in the history of the guitar were the European lute and an Arabic instrument called an oud. The lute had a curved backed and came in a variety of shapes and sizes, had either 4 or 5 courses, and was often strummed with a quill feather. It was a popular instrument for hundreds of years and had passed from the Egyptians to the Greeks, then to the Romans who introduced it throughout Europe. When the Moors invaded Southern Spain in 711AD, they brought the oud along. 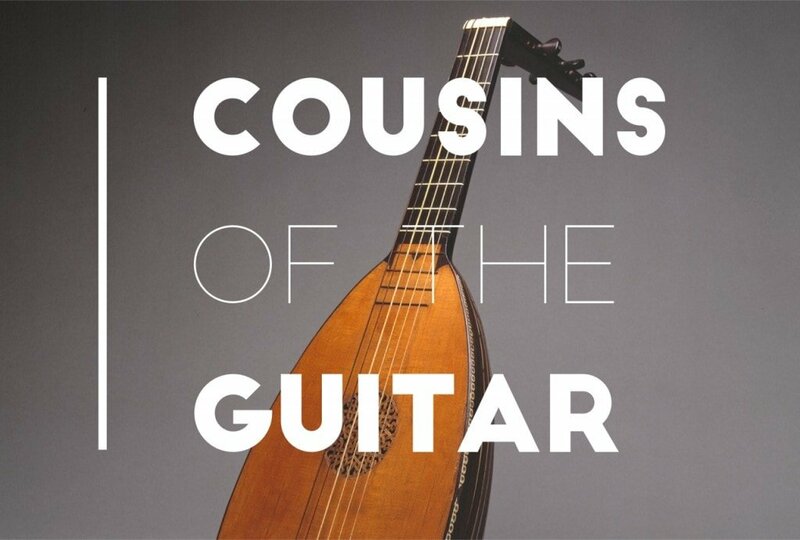 It shared common ancestry with the stringed instruments of Europe, and like the lute, it had a rounded body, though it lacked frets and had a smaller neck. Both the Moorish instrument itself and the Arabic style of playing left a significant mark on Medieval music, and ultimately, the history of the guitar as well. By the end of the Renaissance, the lute had evolved, and frequently had up to 20 or 30 strings, but it was slowly falling out of favor. In Spain, fretted instruments with the familiar curved silhouette of the modern guitar began appearing around the 15th and 16th centuries. Eventually, the Baroque guitar replaced the lute as the most commonly played instrument, and refinements in the number of strings and in the ability to tune these early ancestors of the modern guitar using movable frets made it easier to play than its predecessors. In Spain, an instrument was developed that had an hourglass curve to its body and was played with one hand in front of the hole in the body. Broadly, these instruments were called a vihuela, and are one of the final predecessors in the history of the guitar. By the 1790’s, Spanish guitars had been standardized as to type and had six courses of strings, much resembling a modern guitar. This is where guitar history really gets going, and the innovations start to speed up, eventually leading to the instruments we know and love today. By the early 19th century, guitars looked very close to the six-stringed instruments of today but were smaller in size. In the mid-1800’s, Antonio de Torres Jurado, a Spanish musician and luthier, began creating the style of guitar that would give rise to all modern guitars. Though in modern times he doesn’t get quite as much credit as he deserves, he is in many ways the grandfather figure in the history of the guitar. 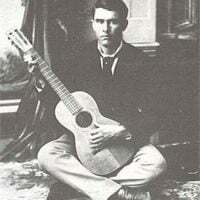 With a broadened body, increased waist curve, thinned belly, and machined head which replaced wooden tuning pegs, his creations became particularly notable thanks to an innovative form of fan bracing and body design, which give classical guitars their distinct voicing and thick, heavy sound. Andres Segovia, another influential Spanish guitarist, took the classic guitar that Torres had created and established it as a concert instrument. He also transcribed early polyphonic music and created complex musical compositions that we now think of as ‘classical’ guitar music. Meanwhile, European immigrants carried a steel-stringed version of the reshaped Spanish instrument with them to America, where the history of the guitar really started to take shape—and where the flat top, the archtop, and eventually, the modern electric guitar would be created. 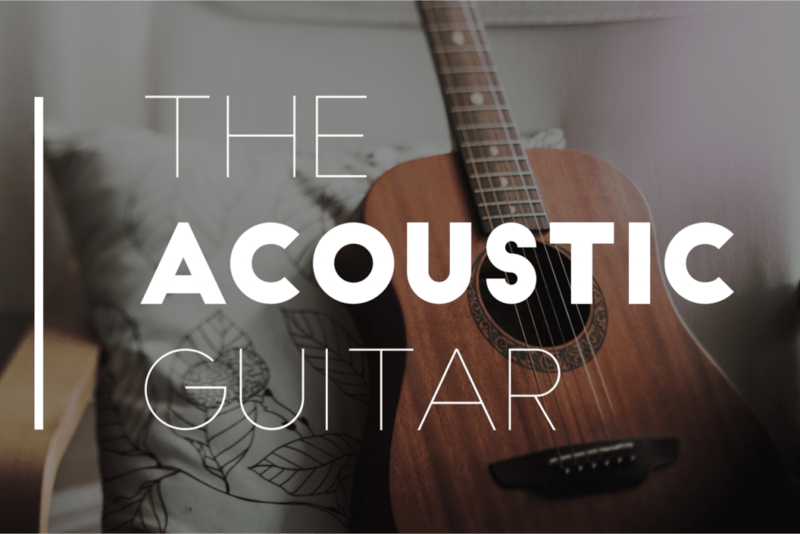 Even today, almost two centuries after its invention, the flat top guitar continues to be the most popular form of the acoustic guitar. It was developed by Christian Frederick Martin, a German-born American luthier who made his first guitar in the United States in the 1830s. Martin created an X-braced guitar body which was able to handle the extra stress generated by modern steel strings, which created too much tension for the Torres-style fan braced Spanish guitars. The tight steel strings also resulted in a different style of playing that made use of a pick. 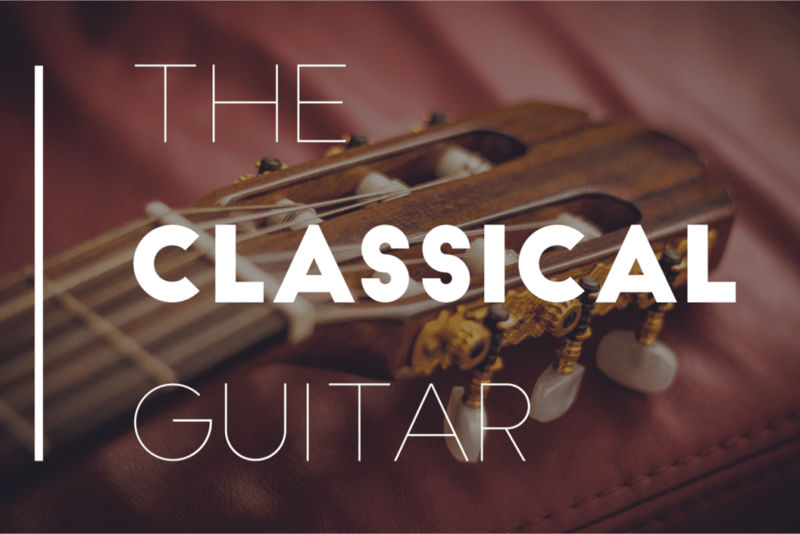 This fundamentally changed the type of music that could be made on steel-stringed instruments, and the precise and delicate melodies of the classical guitar were replaced by brighter, chord-driven music. The common use of picks to play also led to the development of a pickguard, added below the soundhole on most models of the flat top guitar. 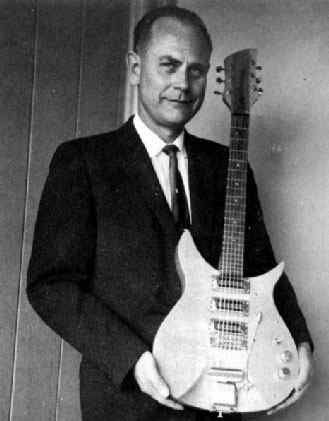 The legendary Orville Gibson, with one of his guitars. The creation of the archtop guitar is usually credited to Orville Gibson. The violin-like sound holes, or F-holes, arched top and back, and adjustable bridge were among the design features that gave the archtop increased volume and tone. Gibson found that, by constructing guitars with bodies that were more like a cello, the bridge exerted no torque on the top of the instrument, which allowed it to vibrate freely and produce a louder sound. Many top American luthiers would take on the archtop as their preferred design—including John D’Angelico and Jimmy D’Aquisto. The guitars were soon adopted by jazz and country musicians and were later used by big bands and swing bands. Despite the 20th Century improvements to the steel stringed guitar and the use of picks when playing, musicians found that guitar was simply too quiet for many forms of modern music. This meant that by the big band jazz era, the guitar was relegated to a second-tier instrument in many ensembles, and brass instruments and the saxophone took on a more prominent position in bands. The guitar became a rhythm instrument and seemed destined to disappear as a solo instrument, in mainstream music at least. Adolph Rickenbacker, posed with one of the instruments he later became famous for. Although many people tried to amplify the guitar’s sound using attached microphones or telephone transmitters in the first two decades of the 20th Century, it was an electrical engineer named Adolph Rickenbacker—at the time, the vice president of the National Guitar Corporation—as well as Paul Barth, and George Beauchamp—a musician who favored the Hawaiian-style lap steel guitar—who in 1932, finally solved the puzzle . 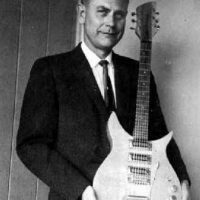 Rickenbacker had founded The Rickenbacker International Corporation with the sole intent of creating electric versions of musical instruments, and with Beauchamp, he was able to pioneer an electromagnetic device that would convert the vibrations of the guitar strings into a clear resonant sound. The resultant ‘Frying Pan’ guitar became the first commercially viable amplified guitar. Hawaiian bands were the first to use the new guitars, but they quickly found their way to Western swing bands and jazz bands. The advantages of the new style of guitar were clear, and many companies including Dobro, National, AudioVox, Volu-tone, Vega, Epiphone, and Gibson began creating their own versions of the electric guitar during the late 1930’s. However, the feedback created by the traditional hollow bodied guitar spurred several players and makers to try and develop a more suitable design. In fact, both Vivi-Tone and Rickenbacker created what were essentially solid-bodied Spanish guitars in 1934 and 1935 respectively to try and solve this problem. The Vivi-Tone model used a single sheet of plywood over a wooden body, while Rickenbacker’s Electro Spanish was made of bakelite. Back to the story: the first commercially successful Spanish-style electric guitar was released by Gibson in 1936 and sold for $150 along with the amplifier and cable. The ES-150 immediately caught on in orchestras, and jazz guitarist Eddie Durham used the ES-150 to play what’s often called the first electric guitar solo. He introduced the guitar to the great Charlie Christian who, during his short life, truly brough the guitar solo to popularity, and reacclimated the public to the idea of the guitar as a lead instrument, rather than as rhythmical background accompaniment. 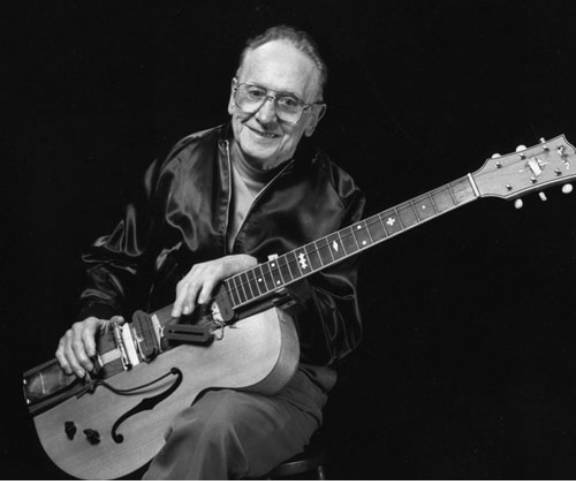 It wasn’t until 1940 that Les Paul—who needs no introduction—created a guitar out of 4×4 wood posts and an Epiphone acoustic archtop (a design that shared almost nothing in common with the well-known solid-body Gibson Les Paul introduced in 1952). This “log guitar” was functionally a solid-bodied guitar that retained the Epiphone body for the sake of appearance only. Most often, Les is given credit as the true inventory of the solid body electric guitar, and through history up to this point, it doesn’t look like his star will ever fade. 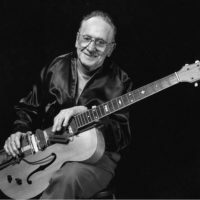 In 1946, Leo Fender, a radio technician and amplifier maker, built the first commercially successful solid-body electric guitar with a single electromagnet. He called it the Fender Esquire, which of course would develop into the Telecaster, the Stratocaster, Precision Bass, Jazz Bass, and so on. In 1951, Gibson released the next evolution of the electric guitar: an instrument that could be played either as a steel stringed acoustic or could be plugged into an amplifier and be played as an electric guitar. The L5CES had a single cutaway body and two electric pickups, an innovation that was immediately popular, and created a sensation among the fledgling rock and roll artists of the day like Chuck Berry who were emerging out of the jazz orchestras and blues bands of the 1950’s to create a sound all their own. 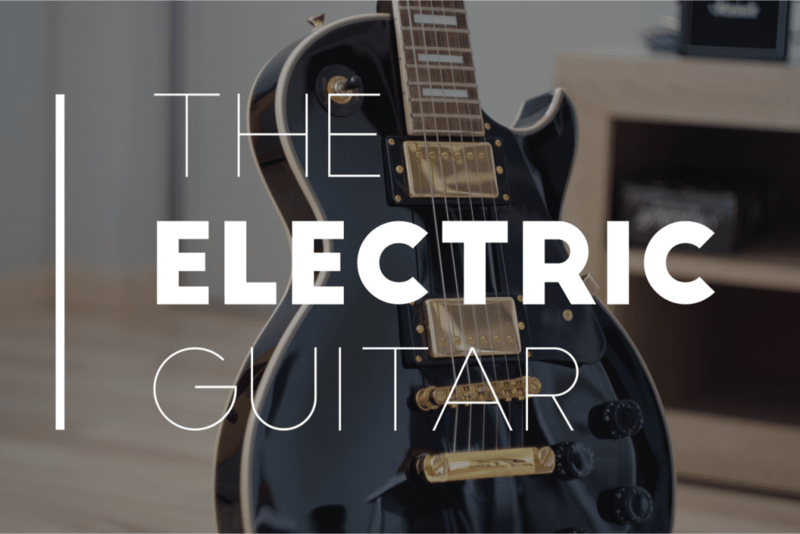 By 1955, the electric guitar had truly come into its own, and innovations like the use of cranked amplifiers, power chords, effect pedals, and so on, would take over modern music and lead to the development of countless genres and sub-genres of popular music. As they say, the rest is history (well, guitar history anyway). In the more than six decades since, guitars have retained their influence as the most iconic instrument of rock and roll—and popular music in general. Though persistent innovations continue to change the shape, sound, and importance of the guitar, and its place in popular culture, it seems certain that the essence of the instrument that was developed over the early course of the 20th century—with roots that stretch to antiquity—will continue to play a key part in the music of tomorrow. The Boss Metal Zone MT-2 Pedal: What’s it good for?